A big complaint among hockey players in the more remote areas is that there is no place to skate over the summer months. This was certainly a problem for me growing up. I grew up in a small farm town and every arena within 100 kilometers took the ice out from March – September. So what does a die-hard hockey fanatic do when there is no ice?… Rollerblades! The only problem with rollerblades is the slight difference from ice skates. The movements are not quite the same – the biggest differences being in stopping and turning – and it is possible to develop bad skating habits if you are rollerblading. Do I recommend rollerblading to hockey players? Absolutely, especially for the less experienced skaters. Yes you could develop a few bad habits, but if you’re having trouble with skating on ice I believe rollerblading will help you develop a better feel for being on skates. Below is a video with 3 skating drills you can do on roller blades that will help you with your skating on the ice. The last exercise will help generate leg power and it is a good workout on and off the ice. I got the last exercise from Jim Vitale from Vital Hockey while helping out at his hockey camp. If you enjoyed this drill and would like more tips on improving your hockey skills you can subscribe to our email newsletter and join us on Facebook. Your HockeyMonkey link is broken (something with the ad affiliate). I just had to comment on how incredible that hockey card is. It has motivated me to go rollerblading right now. I also might have to buy a vintage Bure jersey for shinny. Amazing website. You’ve helped me improve dramatically in the 4 months that I’ve been playing ice hockey. Keep up the great work! Would you recommend waiting for the opening of arenas to start on real ice and avoid developing some bad habits right from the start or would you say that rollerblades are good enough to start, despite all the differences? Thank you for your great videos, they really help me with my stickhandling and shooting ! Get some rollerblades and practice as much as you can. Roller blades can help a lot with balance and muscle memory. You might need to tweak some things once you get on the ice, but doing anything related to hockey is better than doing nothing. Speaking from my experience I think you should use roller blades.I mean you can get bad habits like Jeremy said but they deffenetly help.I used roller blades all the time as a kid.In fact my coach named me captain in my first year because I was a good skater . Trust me it really helps.And I understand that the rinks open late in Switzerland as I lived ther for 3 years.But here in sweden they are open all year long except in August. Hi Jeremy, great post. Are there any drills that I can do on rollerblades to improve my agility on ice ? These drills should help a little with agility and balance. You could watch our learn to skate series and grab a few on ice drills and use them on roller blades. Anything where you can change directions will help, try spinning, turning, changing directions, etc. Great vid Jer! Had a great time working with you at the camp… kids loved having you out! Hey Jeremy, perfect video at the perfect time. I have actually been working on my transitions and having the video just made a world of difference! Now I have a couple more drills to work on, thanks. I have those exact same rollerblades! 3rd con is spot on. I grew up playing roller hockey and recently transitioned to ice. I thought I was playing well until a friend recorded one of my games. My strides are awful. I take too many quick, short strides instead of long full ones. LOL, great find of the Russian Rocket card! He was my favorite player at the time too. 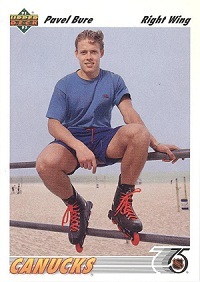 Cheesy as it may be, the card also shows why Pavel was so good. Look at those tree trunk thighs and calves. It almost looks like someone photoshopped that skinny upper body on top of massive lower body. Hey Mike, I haven’t tried these myself, but I’ve read a lot of people say this is the closest you can get to ice on wheels: http://www.sprunghockey.com/ I would give them a shot if I skated on ice more, but I’m strictly an inline hockey player for now (don’t live close enough to an ice rink to give it a shot though I would love to if I could). The surface you skate on probably matters quite a bit too. As always, great content. Can you recommend a good set of hockey rollerblades? I would like to get a pair for summer training. Hey Chris, if you haven’t purchased a pair of blades yet, I recently bought a pair of Bauer xr2 vapors and like them. I have been playing hockey on em for a couple months now and they seem to do well. The only thing I would suggest changing are the insoles. They are lacking in support, but the rest of the skate is great, so far. I have also put a bit stickier wheel on them, as I am typically on a rink, and the surface is pretty slick. Good luck!